Germany's version of reality show Big Brother, which had been intended to run indefinitely in the style of 1998 film The Truman Show, will finish next year. 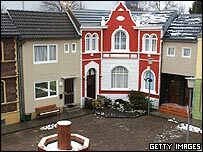 Big Brother: The Village began in March on a purpose-built set outside Cologne that covered 5,000 square metres. But the series - the longest Big Brother so far - will end on 26 February 2006 due to falling ratings. "The series has not attracted as many viewers as we would have liked," said Katja Hofem-Best of TV channel RTL II. Germany's sixth series of the reality TV phenomenon gave contestants the chance to compete for a 1m euro (£682,000) prize. Unlike previous editions, however, participants were expected to work, with the nature of their employment dependent on which social status they were assigned on entering the village. When it launched RTL II described the show as "the world's first real-life soap opera". The Dutch version of Big Brother broke new ground last month when a contestant gave birth on the show.